We get it, it can be easy to go down the Pinterest rabbit hole. Jumping from page to page, getting overwhelmed with inspirational wedding ideas. But, can you really afford to have a photo booth, signature drinks, AND seven kinds of desserts? It may seem impossible to host the destination wedding of your dreams without breaking the bank, but we can assure you, it’s not. With the right planning, budget, and super wedding squad around you – anything is possible. Here are a few tips to help you plan your wonderful dream wedding. There are zero ways around this. (Unless you’re royalty, and money is not an issue.) Setting a budget should be the first thing you do as a bride/groom. It’s vital to crunch the numbers and prioritize the non-negotiables of your destination wedding. 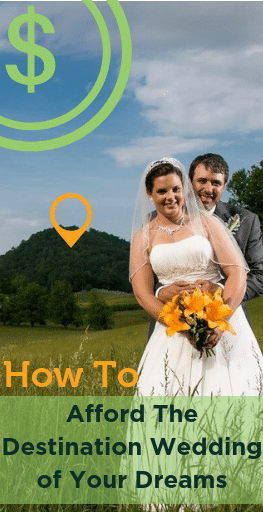 Here are a few steps from Here Comes the Guide on how to set up your wedding budget. Choosing the perfect venue for your destination wedding can be as challenging as a Rubik’s cube. From the location itself to the number of guest and accommodations – it can be a logistical nightmare. However, it’s the most important part of your wedding. Your wedding destination not only determines the mood but the number of guests that can attend, and even the activities you guys take part in. Luckily there’s Sugar Hollow Retreat – the dream wedding destination. It’s a 300-acre majestic wonderland fully equipped to host your beautiful wedding. Whether you have 50 or 350 guests attending your wedding, this location has the pristine landscape to make your ceremony memorable. And the best part of this majestic place, it’s extremely affordable! With seasonal wedding packages, you could have your 75 guests pitch in as little as $33 for the destination wedding of your dreams! Everyone can feel like they contributed to a wondrous event. Don’t let the pressures of having a ‘grandiose wedding’ cloud your judgment. After all, this special day is about you and your soon-to-be spouse. So, as long as you and yours are relaxed and happy, there shouldn’t be a need to overspend on your destination wedding. Spend little, love a lot! This seems like a no-brainer, but you must save! You can’t afford the destination wedding of your dreams if you don’t store some change in the piggy bank. Check your monthly expenses and see what you can cut back on. You might find out your latte consumption is cutting into your potential wedding budget. Here are some other ways you can save up for that dream wedding of yours! Once you’ve done the math and everything is ready to plan, head over to Sugar Hollow! We can’t wait to host your beautiful event. Feel free to check out our famous wedding spots and ask about our pricing sheet. Hope to see you there!